I went hunting today around 4pm. However, I forgot to put batteries in my camera! The first two pictures were taken with my blackberry camera, which isn’t particularly good. My apologies. 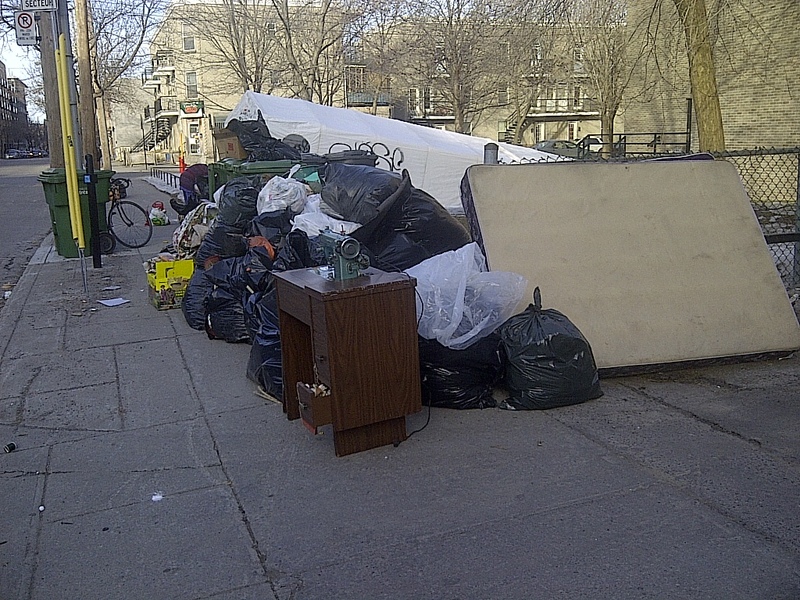 Regardless, I came across this massive pile of trash on Maguire near St Laurent. It was a mess. I think whoever brought the stuff to the curb did so in a hurry. There were a couple of people picking through the trash when I got there. A woman walked by at some point and talked to us – she seems to have some knowledge of the situation. My french isn’t very good but I heard the word “décéder” – this was the stuff of someone who passed away. I found a piece of ID with a birthdate marked 1933. Given the contents of the trash the old woman was Portuguese. Most of the stuff was fairly new. The two people picking next to me (who seemed to know each other) loved the bizarre dollar store products that I kept pulling out of the bags. There were lots of musical boxes and odd figurines. I gave them plenty of stuff and didn’t keep too much for myself – there wasn’t much I really needed or wanted to deal with anyways, other than a ceramic (Portuguese) turkey I sort of wish I hadn’t given them! There was also lots of religious paraphernalia – rosaries, bibles, crosses, and so on. 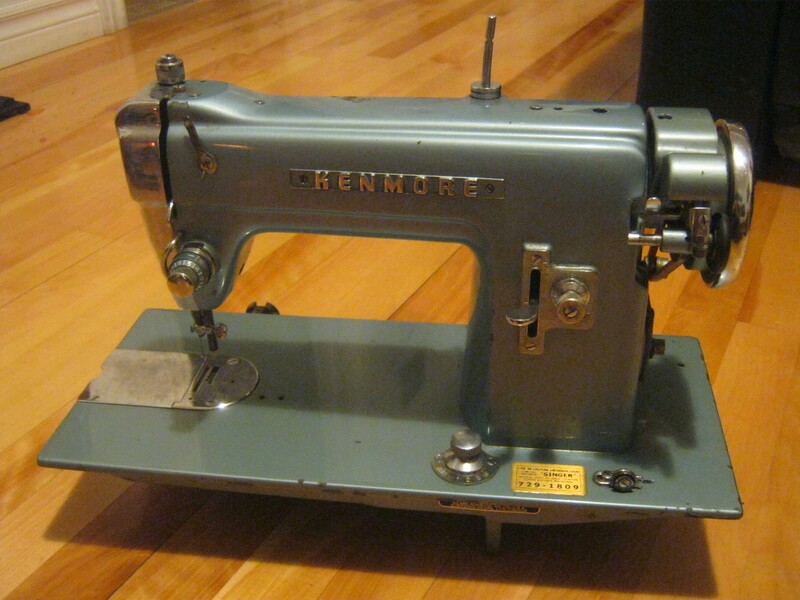 This old Kenmore sewing machine was in it’s original table. The table wasn’t in particularly good shape so I used a knife I found to unscrew the machine from the table. I plugged it in and it ran well… for a second. The motor started smoking and I could see sparks on the inside. Now it doesn’t seem to go, although the motor’s still trying. Still, it’s a nice looking machine. I put it up on Craigslist to see if anyone wants to try to fix it. It might be an easy repair for all I know. My most interesting find was these two unopened bottles of booze. 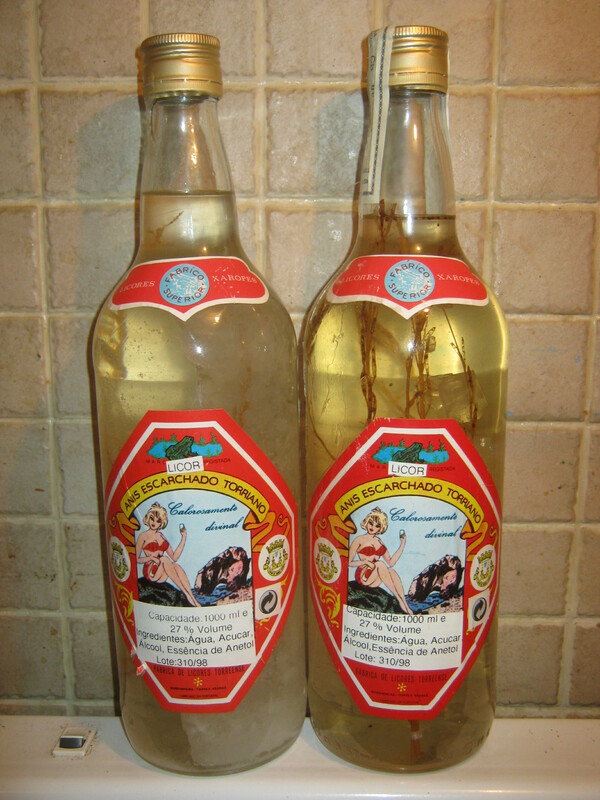 It’s some kind of Portuguese anise liqueur that comes a stem of anise (or three – the one on the right has more, which is why I think it’s a bit darker) and a big chunk of crystallized stuff in each bottle. My room-mate did some research and found that it’s likely sugar (makes sense, given that the second ingredient is “acucar,” or sugar) and that it was probably designed this way. From the looks of it the name of the drink is Anis Escarchado Torriano. Can anyone help translate this? I’ll definitely try a taste of these at some point, unless someone convinces me otherwise. I didn’t bring much else home from this spot. I did find a couple of light bulbs that were in their original packaging and a 1.60 in change. I came across another collection of bags on St Dominique. 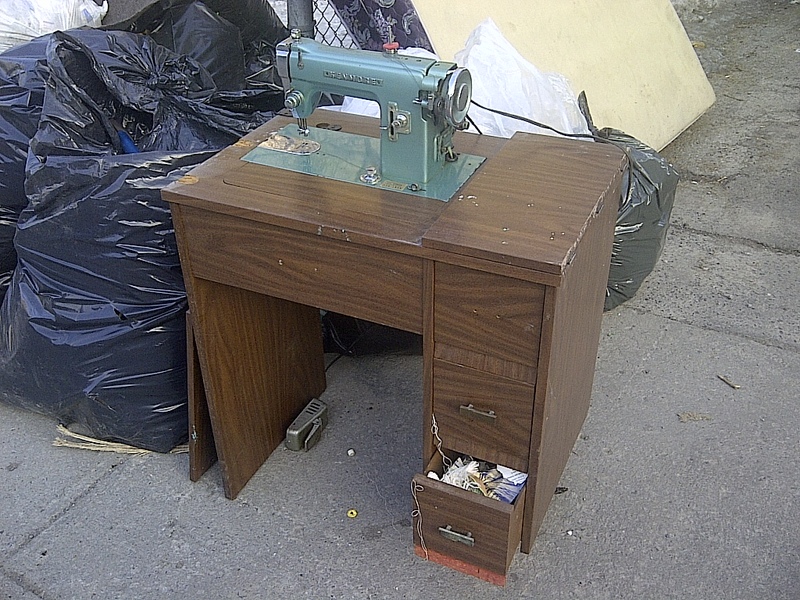 A woman was bringing some old junk that was taking up space in her basement. I talked to her a bit and she was pretty helpful and kind. There were some nice pottery pieces which she apparently made herself. I took three with me, but only this one survived the bike ride home. 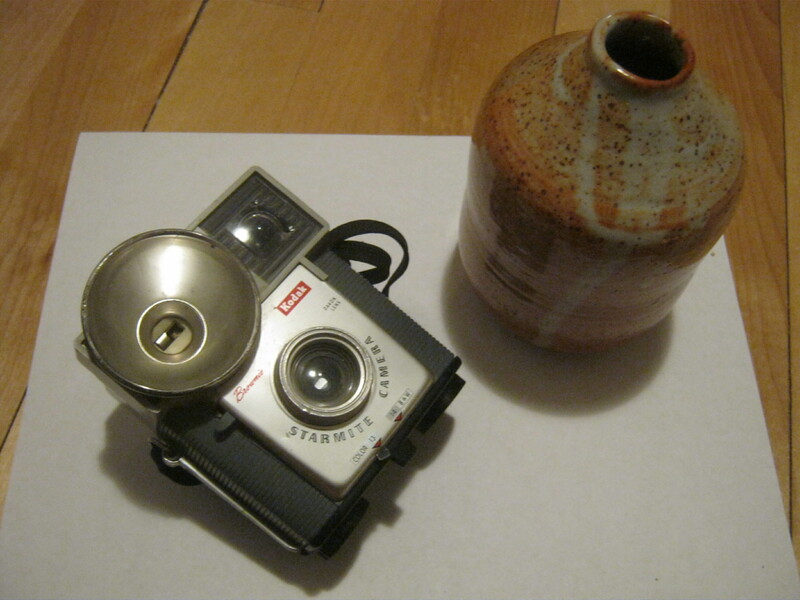 I also found this old Kodak “Brownie” camera. It looks like it’s in pretty good shape, and it’s destined for the CL free section. Looks like it’s going to start snowing tonight and stay that way for a whole day. The weather report is calling for about 25-30cm. I’m not too optimistic about tomorrow’s trash day! The only anise liqueur I’ve tried is Ouzo … and that stuff was dreadful! I don’t know about the sprigs of whatever in your bottles, buy hey, what doesn’t kill you, makes you stronger, right? I figure they’re springs of the anise plant. I haven’t tried it yet but I’ll keep you posted! I Googled the anise plant. I see it looks a lot like Queen Anne’s Lace. If you are foraging through trash to help the environment,I also suggest you turn vegetarian 100%.Vegetarianism is much better than the environment than eating meat.It helps reduce water waste,prevents pollution,etc.It also helps reduce the slaughter of animals and improves your health.I am 100% vegetarian since five years,though I still eat some eggs and dairy products.Being vegan may be even better,but it is harder.I have two or three Muslim friends from Lebanon,Iran and Pakistan who have turned vegetarian 100%.Hope you will follow my advice.I just want to say I love your blog and admire your goals. I cook only vegetarian food but I wouldn’t call myself a vegetarian. I eat meat sometimes when other people cook it and offer it to me. I think what question of what to eat (and what is moral to eat) is one of humanity’s oldest dilemmas. I think a lot about it myself. I feel that as an omnivorous animal I’m designed to eat meat. Maybe not a lot of meat, but some. There’s a certain texture and feeling to meat that distinguishes it from other forms of protein (such as beans, lentils, peanuts, tofu and so on). Meat is also fulfilling in a way that none of these things possess. It’s hard for me to think that my body doesn’t work best without a small amount of meat consumption. Of course it depends on what you do, what your body is like, and so on. I often bike 2-4 hours in a day and I think that all that physical exercise may make meat more necessary. I’m not sure about any of this though, just my current thoughts! Regarding the ethics, I think of animals as conscious beings – not as “smart” humans but with similar emotions and feelings. As such I think they should be treated well. I avoid factory farm meat and buy only free-range eggs. Check Mentana street in the Plateau from one end to the other on trash day.My best friend lives there.Also check St.Zotique street and Belanger street in Rosemont.The massive snowfall after St.Patrick’s Day is a temporary irritant,but temperatures are quite pleasant today and temperatures will be climbing a bit as the week progresses. I’m on Mentana pretty often and hope to get out to Rosemont more often soon – there seems to be a lot of good trash out there! Rosaries,bibles,crosses and religious figurines do not belong in the garbage in the first place.Whoever did the dumping did not separate the broken appliances,spoilt food and junk from the good stuff .It is gross mismanagement of a dead person’s belongings.One of my neighbors died of heart disease in his condo.Relatives came and took away all the knick-knacks and photos.They only threw out the spoilt food and some appliances on the street.I hope when most people die,their belongings are not just dumped on the street. In Outremont,the recycling truck passes every Wednesday morning.I am hoping you will visit Outremont often. Yup! Hopefully most of the snow melts before the end of the month so it’ll be easier to move around. Do you go checking the trash in the Plateau east of Dorion or Papineau?You might find a shift in demographics in that part of the Plateau. I’ve been nearby – a bit further east in Hochelaga-Maisonneuve – and north as well. I’ve never right by the bridge though. I’ll definitely check out around there at some point. Please rescue books that you find in the garbage and recycling bins.You can either give them away,try to sell them or keep them and build a small or big home library.I have an e-reader,but I prefer reading on paper and I love adding books to my home library.Books must not be thrown out.I encourage you to build a home library for yourself or your family.You can contribute books you rescue to your family library,and in some cases to literacy centres. Figurines,music boxes,rosaries,Bibles and religious paraphernalia in the garbage?This is extremely disrespectful to the Portuguese woman who apparently died at the age of 79 or 80.Could the person not have given this stuff to a church or given it away through an ad on Craigslist or Kijiji?Shame on the person who threw all these things out.Landlords are not allowed to throw out a dead person’s belongings on the street ,unless all the options are exhausted or in rare extreme situations.Do you know some landlords have been sued for this kind of thing and have had to pay stiff penalties or reparations or even fines for this.It is possible that it was not the landlord who threw out this paraphernalia. If you don’t want the Anis, I would happily take them off your hands. It’s been a long time since I’ve had good Anis. 1977 in the Azores as a matter of fact.